Submitted photo Tech Sgt. Wayne McNutt, National Air and Space Intelligence Center intelligence analyst (right), waits with his wife, Angela, before heading out on one of the group rides as part of Wright-Patterson Motorcycle Safety Day held at the National Museum of the United States Air Force May 6, 2016. 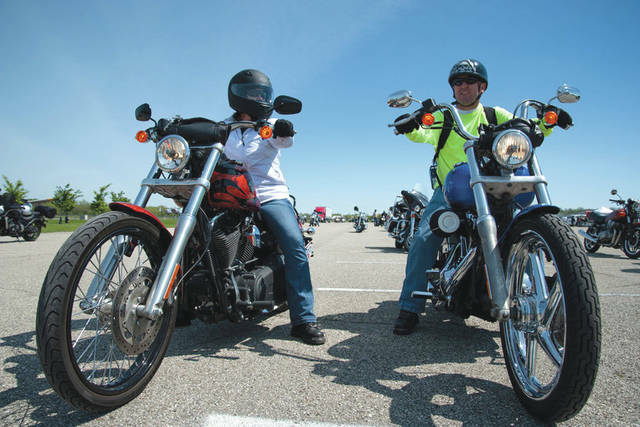 WRIGHT-PATTERSON AIR FORCE BASE — Riders from the Wright-Patterson Air Force Base-area will learn ways to “keep the rubber side down” during Motorcycle Safety Day 2018 scheduled for 8 a.m. to 4 p.m. Friday, May 11, 2018 from at the Base Theater and Commissary/Exchange parking lot. The phrase, referencing the proper vertical orientation of a motorcycle, interjects a bit of tongue-in-cheek humor into one’s genuine concern for a friend’s safety and also encompasses the aims of the base-wide event which includes briefings, instruction, skill-tests and an optional 38-mile group ride. U.S. Army Maj. Gen. John C. Harris Jr. and Chief Master Sgt. Jeff Richards are scheduled to be keynote speakers, sharing their extensive motorcycle experiences with riders. Harris has more than 25 years of riding experience and is currently the assistant adjutant general for the Ohio Army National Guard in Columbus. Richards is one of the original founders of the Green Knights International Military Motorcycle Club that now includes more than 140 chapters on U.S. military bases worldwide, including a chapter in the local area. “I’m very much looking forward to spending the day with like-minded, safety-conscious people with an appreciation for two-wheeled recreation,” Harris said. This year’s training will also include a briefing from Dr. Ray Ochs, Motorcycle Safety Foundation’s vice president of training systems and lead developer of the MSF Basic RiderCourse, which has been required skills training for all military riders for more than 20 years. There will also be discussions on stunting and risky behavior, highway hypnosis, riding in different environments, seeing and being seen as well as an annual safety briefing. Besides lectures, riders will receive a wealth of practical skills training to improve their situational awareness and safety. Riders can receive training on personal protective equipment as well as a system of checks to ensure their motorcycles are safe to operate. The inspection, called T-CLOCS, stands for tires and wheels, controls, lights and electrics, oil and other fluids, chassis and stands. Safety experts recommend performing the inspection before every ride and rider coaches from the Wright Wriders and Green Knights will be available to walk attendees through the process. There will also be a blind spot practical demonstration as well as a slow-ride competition where riders will vie for the taking the longest time to go from point a to point b – the gyroscopic force of spinning wheels at speed helps motorcycles stay upright, going slow is a challenge. There will also be plenty of fun at the event with multiple food trucks and nearly a dozen local vendors available from 10 a.m. on through the conclusion of the event. Motorcycle Safety Day meets the annual pre-season briefing requirement for military riders with civilian riders encouraged to attend. Military riders who attend the briefings and participate in the group ride will satisfy their five-year motorcycle refresher training requirement. The 88th Air Base Wing commander has designated this event as an alternate duty location. https://www.fairborndailyherald.com/wp-content/uploads/sites/50/2018/04/web1_160506-F-JV466-018.jpgSubmitted photo Tech Sgt. Wayne McNutt, National Air and Space Intelligence Center intelligence analyst (right), waits with his wife, Angela, before heading out on one of the group rides as part of Wright-Patterson Motorcycle Safety Day held at the National Museum of the United States Air Force May 6, 2016.